Hello and welcome to part 2 of our Washington Gin showcase. As we mentioned in part 1, we have a lot of craft gins to choose from here, showcasing an amazing range of flavor profiles. All of them are very unique, giving you many selections among which to find your favorite, or if you’re like us, allowing you to fine tune each cocktail with the right gin to get the best flavor. For part 2, we chose Isis Premium from MacDonald Distillery, Amethyst from The Ellensburg Distillery, Counter Gin from Batch 206 Distillery and finally Oola Gin from Oola Distillery. Strong juniper and lavender, a lot more of the allspice and clove. Again we have four gins that are all very different both in the nose and on the palate. The Bebbo – This is one of our favorite underrated classic cocktails. We felt that the floral and herbal notes of the gin would pair nicely with the honey. 1/2 oz honey – It’s important to heat the honey first so it dissolves in the drink. Otherwise you end up with a lump of cold honey in the bottom of the shaker. Lemon and honey really pick up the thyme and herbal notes. Mineral-y, slate-y notes on the mid-palate, reminiscent of a dry white wine, and lovely if unexpected. A fine example of where the final drink is more than the sum of its parts. Very well-balanced, with a lot going on. The Blue Moon – We felt the violet and floral notes of the Creme Yvette would pair nicely with the lavender in the gin. Pleasant violet and lavender nose with a really strong savory celery note, and the palate is the same – pronounced violet and lavender notes with a savory underpinning. The Creme Yvette really pulls out the lavender. There’s also a refreshing, astringent bite from the gin and the lemon juice on the back on the palate. This would be very nice on a hot summer afternoon. The gin really stands out in this combination to make a spirit-forward drink. Jasmine (by Paul Harrington) – with Aperol (the original is with Campari). We substituted the Aperol because we felt its bitter orange components would pair well with those same elements in the gin. Strong bitter orange and lemon flavors to start. Tarragon notes on the mid-palate. Slight astringent bite at the end. Bitter orange notes of the Aperol pair nicely with the bitter orange notes of the gin. Very earthy finish. Cabaret – This is a fairly delicate gin so we wanted something that wouldn’t stomp all over it. We also felt that the herbal nutty notes of the Benedictine would pair nicely. Candy-sweet start, strong herbal notes from the Benedictine on the mid-palate, then more of the spicy, bitter, aromatic flavors from the Angostura on the end. Starts sweet and then has a nice dry finish. We really like this drink because of the way it changes on the palate. It starts out as one thing and turns into another. One interesting alternative would be to use sherry in place of the vermouth to add even more nutty notes and pair with the almond notes of the gin. Once again, we have some really interesting craft spirits here. If you’re a gin enthusiast (or just like booze in general) you really owe it to yourself to try some or all of these gins as well as the previous four. They’ve all got a lot going on and offer some really interesting flavors both on their own and for mixing. 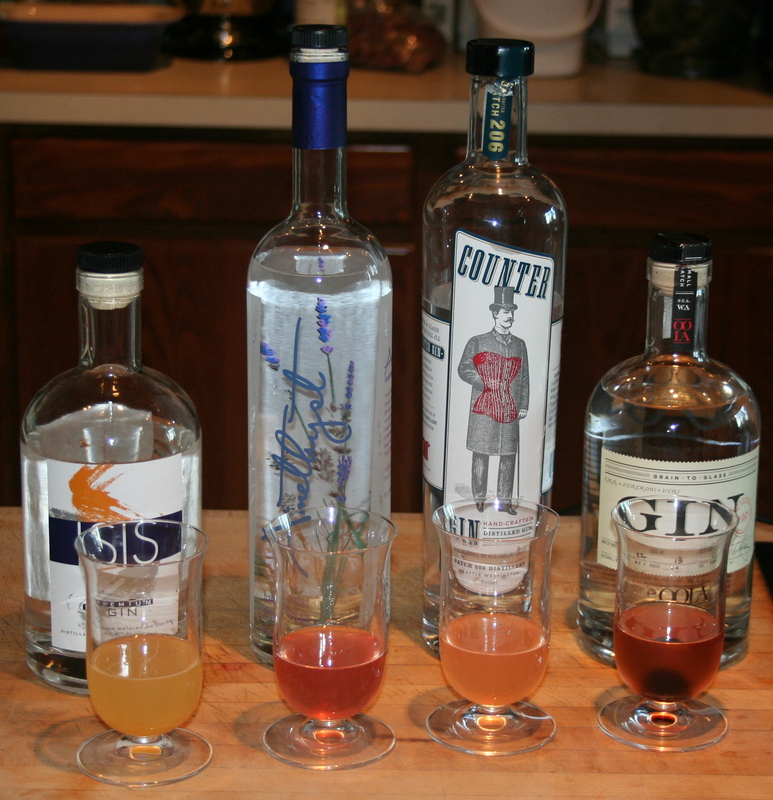 We look forward to trying our next 4 selections, (yes there are that many Washington gins! ), and we hope you do too. Update: Be sure to check out Part 3, Part 4 and Part 5! This entry was posted in Booze Review, Cocktail, Gin, Original Cocktail, Review, Showcase and tagged amethyst gin, amethyst gin review, Bebbo cocktail recipe, blue moon cocktail recipe, classic cocktail recipe, counter gin, counter gin review, Gin, isis gin, isis gin review, oola gin, oola gin review, Original cocktail recipe, Washington gin. Bookmark the permalink.